Da Capo Press, 9780306822551, 512pp. Heads: A Biography of Psychedelic America uncovers a hidden history of the biggest psychedelic distribution and belief system the world has ever known. Through a collection of fast-paced interlocking narratives, it animates the tale of an alternate America and its wide-eyed citizens: the LSD-slinging graffiti writers of Central Park, the Dead-loving AI scientists of Stanford, utopian Whole Earth homesteaders, black market chemists, government-wanted Anonymous hackers, rogue explorers, East Village bluegrass pickers, spiritual seekers, Internet pioneers, entrepreneurs, pranksters, pioneering DJs, and a nation of Deadheads. WFMU DJ and veteran music writer Jesse Jarnow draws on extensive new firsthand accounts from many never-before-interviewed subjects and a wealth of deep archival research to create a comic-book-colored and panoramic American landscape, taking readers for a guided tour of the hippie highway filled with lit-up explorers, peak trips, big busts, and scenic vistas, from Vermont to the Pacific Northwest, from the old world head capitals of San Francisco and New York to the geodesic dome-dotted valleys of Colorado and New Mexico. And with the psychedelic research moving into the mainstream for the first time in decades, Heads also recounts the story of the quiet entheogenic revolution that for years has been brewing resiliently in the Dead's Technicolor shadow. Featuring over four dozen images, many never before seen-including pop artist Keith Haring's first publicly sold work-Heads weaves one of the 20th and 21st centuries' most misunderstood subcultures into the fabric of the nation's history. Written for anyone who wondered what happened to the heads after the Acid Tests, through the '70s, during the Drug War, and on to the psychedelic present, Heads collects the essential history of how LSD, Deadheads, tie-dye, and the occasional bad trip have become familiar features of the American experience. Jesse Jarnow is the author of Big Day Coming: Yo La Tengo and the Rise of Indie Rock and Wasn't That a Time: The Weavers, the Blacklist, and the Battle for the Soul of America. His writing on music, technology, and culture has appeared in the New York Times, Pitchfork, Wired.com, Rolling Stone, Dupree's Diamond News, and elsewhere. He is a contributing editor at Relix, and hosts the weekly Frow Show on independent Jersey City radio station WFMU. He tweets via @bourgwick and @HeadsNews and lives in Brooklyn. 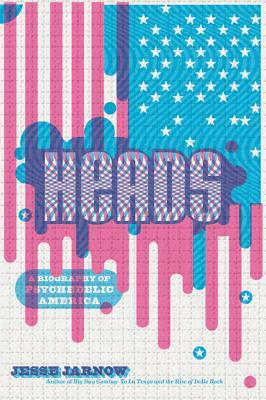 "Heads traces the long arc of America's conflicted love affair with chemically engineered epiphanies long past the point where most hip historians throw in the tie-dyed towel...[An] infectiously enthusiastic account." "Thoughtful and compelling...The story of psychedelics and the Dead may never have been so interestingly told. A must for fans of the Dead and for anyone interested in the history of drugs or the counterculture." undefined—Addicted to Noise, "Best of 2016: Top 5 Books"
"[Jarnow] is our generation's foremost Grateful Dead chronicler, and something of a cultural ambassador to the punks and indie kids who might not otherwise pay the band any mind." "Music, history and psychopharmacology blend together in Heads...Jarnow describes in colorful and scrupulously researched detail how psychedelic music fused with actual psychedelics to create a ceaselessly regenerating 'hip economy' that persists to this day...It's a head trip and then some." —Rolling Stone, "10 Best Music Books of 2016"